Reviewed by Sally Marchant from www.naturallyhappydogs.com, the online video magazine. 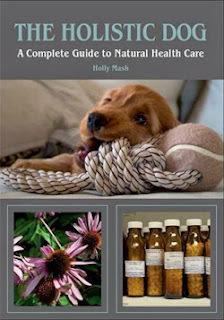 At first glance, "The Holistic Dog: a complete guide to natural health care" by Holly Mash appears to be a small book but it is packed full of very good information. It begins by clearly outlining what complementary therapies are and explaining what makes them different to conventional veterinary medicine. It explains each of the common types - Homeopathy, Herbal medicine, Acupuncture, Bach flower remedies, Tellington touch and Chiropractic and for each, explains how it works, what it's used for, how it is administered, dosages and how to find a qualified practitioner. The language is a little technical at times, for example "serially diluting the active component in a solution and vigorously agitating it" but on the whole, the book is very readable, using the technical terms only where appropriate. The author gives plenty of examples to clarify any statements that are made and to add understanding to concepts throughout the book. I was quite surprised that the book also includes helpful information for anyone considering getting a dog. It includes such topics as deciding whether you have the time and energy for a dog and the benefits of dog ownership. I had assumed that the book would focus on holistic treatments but it actually looks at every single part of dog ownership, from the initial decision about getting a dog, through to that 'final' sad decision at the end of the dog's life. Every aspect of dog ownership is considered from a holistic perspective, encouraging the reader to consider their decisions carefully. For example, the author posits questions like: Do you really want a long coated breed if you live in the muddy countryside? How might Bach Flower remedies be helpful for settling a new rescue dog? How can looking for 'qi' help to pick a suitable puppy from a litter? Throughout the book, 'standard' advice such as leaving a new puppy with a favourite toy for their first night in their new home, is mixed with 'complementary' advice such as the benefits of the homeopathic remedy aconite and TTouch when a puppy is teething. The chapter on the canine mind is full of very up to date, modern thinking about training dogs, clearly explaining why 'dominance' based methods are outdated. Using pictures to illustrate, this section explains how dogs communicate, again including holistic advice such as initially visualising your dog's good behaviour before proceeding to teach it. The importance of exercise and playtime and the effects that feeding can have on behaviour are covered as well as training theories and techniques. Following this is information about preventative health care looking at vaccines, neutering, worming and flea treatments from both a conventional and a complementary point of view. The author explains the pros and cons of each and also covers the benefits of combined health care such as what homeopathic remedies to give if your dog suffers a vaccine reaction. The nutrition section doesn't preach about what type of food one should feed, but gives clear information about what to be aware of when raw feeding and warning signs to look for on complete foods such as labelling terms, certification logos and whether the food is ethically sourced. The supplements section gives information about each of the main dietary supplements, what they are and what they are used for, this section encourages the reader to ask questions such as where the ingredients are sourced and how much active ingredient is in the product. There is some fantastic advice about looking after the elderly dog such as using different scents in different rooms as the sense of smell is often the last sense to fade. The author suggests giving the dog who can't get out and about some picked plants for him to sniff in bed for a bit of mental stimulation. This section also covers saying goodbye and what help and support is available. The last chapter covers typical holistic treatments for common ailments, including common symptoms, routine care and complementary treatments. The book is full of large, lovely pictures which help to break up the information and often give helpful visual aids to what is being explained, and important points are often highlighted in coloured boxes. There is a useful 'addresses and further reading' section and a comprehensive index. This book is not so much of a 'how to' in terms of treating problems or training dogs, but it gives a very clear and thorough explanation of the underlying concepts and ideas. Throughout, it advises if you have a specific medical problem; to seek advice from a veterinarian; for general training to attend classes and for major behavioural problems, to visit a behaviourist. I would say this book is perfect for someone interested in natural care who is looking to get a new dog, or even those who already have a dog who want to look over their complete care of their pet to take into account holistic ideas. It is more of a 'reading' book than a 'reference' book, but whether someone reads it cover to cover or dips in to a chapter at a time, I would recommend this book to anyone who would like to lead a more natural life with their current, or future dogs.